The readme mentions --scrypt option - but I can't seem to find a way to turn it off. Is it just that the windows binary is compiled for scrypt and I need to compile without it? This means the pool you have configured is a scrypt pool. It crashes and goes to the windows close program or look for solution box. It should still print out some debug info first...? I don't see a debug file. If there is what is the name of it. Found this in the debug log. I don't know why he's scammer flagged, and I don't blindly trust such flags. He seems to be behaving decently in threads I've seen, at least. Plus he is responsible for providing the X6500 I did the development with, so if I refused to help him I would arguably be a scammer myself. This should be ignored. -D -T will just print debug info to the command window, it won't make a file. That is the error that I get owhen I use bfgminer ... --debuglog 2>debuglog. If I use -D -T it does to the windows error message. Are you able to provide remote access to the rig having this problem? If so, would it be okay if I install debugging tools on it? Either way, please open a GitHub Issue for further tracking and meet me on IRC sometime if possible. It does not start working on a new block, it says,for example, started [01:30:20] and does not ever change blocks. That makes no sense to me. I thought scrypt was something to do with litecoin? I haven't changed the pool - currently BTC Guild via stratum proxy. Why do I need to care about scrypt/litecoin and what should I be reading? Hopefully this fixes everyone's problems and more! I've also bumped the stable release to 2.8.4 including the fixes relevant to the 2.8.x versions. RPC: Add support for X6500 FPGAs. Enforce --expiry option to make solo mining without longpoll move on eventually (fixes jborkl's problem). 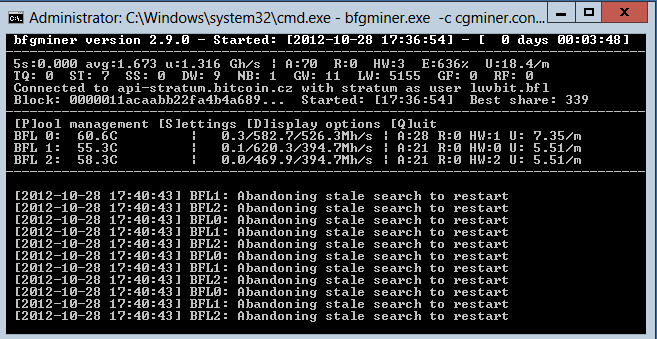 Always detect non-scrypt if Stratum is in use (fixes julz's problem). Various other bug fixes, including bitpop's problem and a number of memory leaks. server and client sockaddr_in are no longer used in struct pool. Set sshare id and swork_id within the sshare mutex to avoid multiple share submits with the same id. Fail on select() failing in stratum thread without needing to attempt recv_line. Add share to stratum database before sending it again in case we get a response from the pool before it's added. Shorten the initiate stratum connect timeout to 30 seconds. Shorten the stratum timeout on read to 90 seconds to detect unresponsive pool. Display best share difficulty on exit. Make stratum socket fail more robust on windows by disabling the send buffer. Reuse the same curl handle forcing a new connection instead of risking derefencing. Add information about submission failure to stratum send. 2.9.1 Mining nicely on a Raspberry Pi, however I do get Comm Error disconnects randomly with 4x BFL Singles. Google search lead me to the issue board, and post discussing that this is due to the usb problems on the raspberry pi. I have a 512 MB RPi on order to see if the new reversion fixes the issue. New version(2.9.1) does NOT crash windows 7 x64 for me. Current uptime with new version approximately 12hrs on W8x64 & 8hrs on W7x64. Previous version(2.8.2) crashed windoze within minutes. Whatever ya done, TY! Donation inbound. As I understand it, there's a way to upgrade the firmware on old revisions too.